Large daily fluctuations in dissolved oxygen levels are characteristic of bodies of water with extensive plant growth. Dissolved oxygen (DO) levels rise from morning through the afternoon as a result of photosynthesis, reaching a peak in the late afternoon. Photosynthesis stops at night, but plants and animals continue to respire and consume oxygen. As a result, (DO) levels fall to a low point just before dawn. Dissolved oxygen concentrations may change dramatically with lake depth. Oxygen production occurs in the top portion of a lake, where sunlight drives the engines of photosynthesis. Oxygen consumption is greatest near the bottom of a lake, where sunken organic matter decomposes. In deeper, stratified, lakes, this difference may be acute – plenty of oxygen near the top but practically none near the bottom. In areas of a lake that are shallow and easily mixed by the wind, the DO concentration may be fairly consistent throughout the water column. 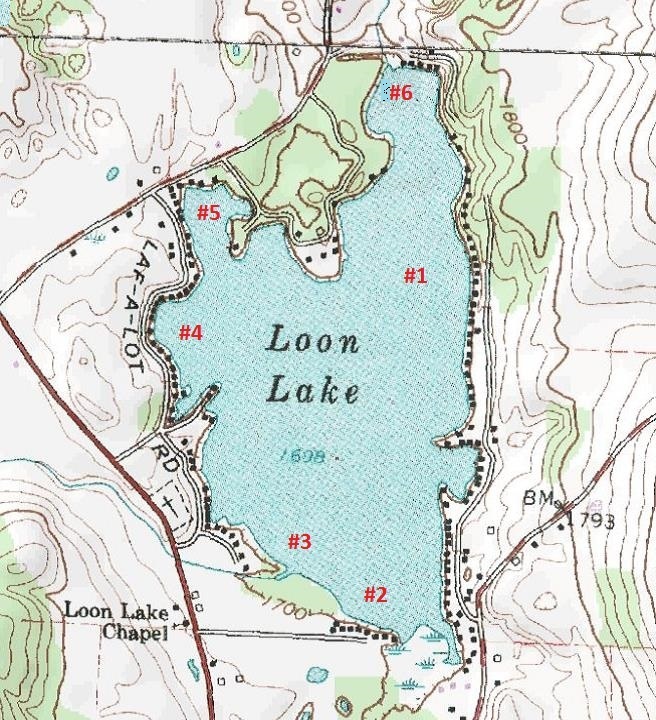 A number of areas are sampled for dissolved oxygen levels around Loon Lake. The most telling data comes from the eastern basin along the northern portion of East Lake Road as this is the deepest area of the lake being approximately 13 meters (40 feet) in depth and exhibits the stratification phenomenon discussed earlier. Sampling is also done at a number of other shallow areas around the lake (see map below) to understand how levels of DO might vary. Sampling is done with a handheld dissolved oxygen meter (YSI 550A) which the lake association purchased in 2011. Samples are taken at approximately the same time (around dawn) on a biweekly basis. The data is tabulated and charted as shown in the DO profiles.